The map below, based on Paul Hockings’s research, shows the division of Badaga Villages into the four ‘SEEMAYs’. As I have explained in the page ‘Hattis’, Badaga Villages are grouped into clusters / communes [there is no particular number as to how many villages will constitute one commune] called OORUs and these OORUs in turn constitute a NAADU or SEEMAY. It appears that initially there were only three seemays/naadus with DHODDA Betta peak being at the apex. KUNDHE NAADU / SEEMAY might have ben added later. More info will be added…. Dr.B.Sudhakar.MBA.,Ph.D.,DLL. [Assistant Professor,Department of Management Studies,MAHE-Manipal( Dubai Campus), DUBAI]. I am one among the interested Badagas, who would like to know little more about number or oorus in different seemaes. For eg, Halattanai to which I belong to is the head hatti (oor) for Keeyur Aaru hatti which includes Denadu, Mainalay, Kothiben, Masikandi, Bengal and Kokkalada – inturn the Keeyur comes under Mekku nadu seemae. Now I am trying to bring a group of hatties coming under different seemaes, based on thier close relationships (anna thamma relation – having one Iyya gudi in the head hatti from where brothers migrated and settled else where). Coming to my next point I’ve some doubts like…………..
From the history it is understood that Koderi , Kinnakorai and Hubbathalai people are brothers and they belong to or called as Porangadu people. Am I right?. ……….but in your website those hatties (Koderi and Kinnakorai ) I feel are wrongly classified……………..
For eg. 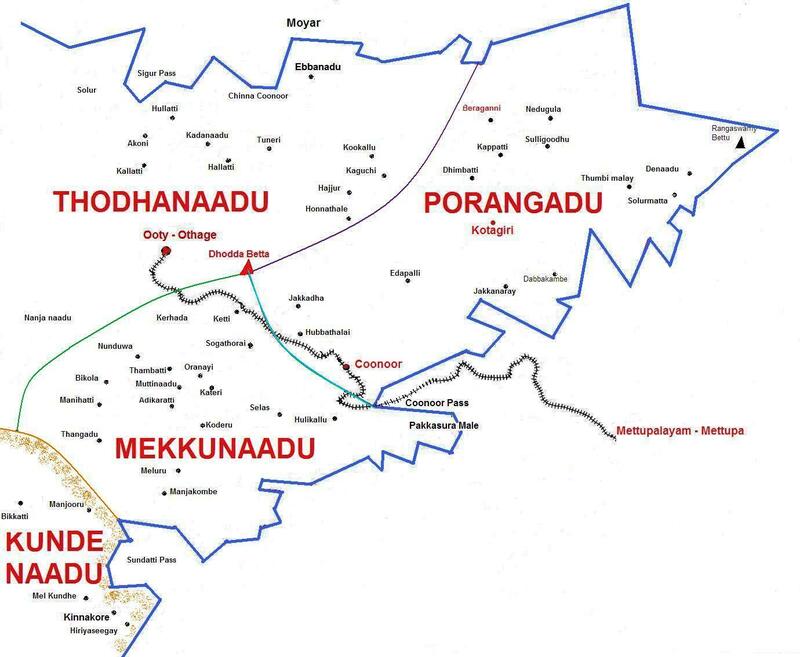 Koderi is included in the Mekku nadu seemae but they belong to Porangadu people. One more eg., Kinnakorai people are Porangadu people but that is included in Kundae seemae. My question is that …..are hattities classified based on location or the relationship? Thank you Dr.Sudhakar for your letter. You have made some interesting observations. Firstly, from my research, I find that a few hundred years back there was a Madhuvae /Hattaru ‘Kula’ [roughly can be translated as a ‘group’] among the Porangadu Seeme ‘consisting of seven maximal linages associated with but not confined to Kaigaru, Kinnakore, Kada malai, Tandanadu, Meedhenu and Hubbathalai along with ‘Mutharu’ – ancestors -‘which is only represented in Adigaratti, Kenduva, Koderu, Bikkolu and Muttinadu’ [Prof.Hockings]. The implication is, as the name indicates (Madhuve Kula), that the people belonging to these hattis did not marry among themselves [anna -thamma more]. I also find that some hattis were/are grouped under a diffent commune[OORU], in some specific cases. For example, Koderu [Koderi] initially belonged to (now abandoned)TUDUR commune, then to HULIKKAL and now to MELUR commune. Another very interesting information about Koderi [consisting of mel Koderi and Keeya -Kil -] is that it forms the boundary of Porangadu and Mekkunadu. May be, as Prof.Hockings indicates, even the naming of the hatti suggests that. KODU AERU or BOUNDARY ASCENT. If you have visited Koderi hatti – you will understand the ascent I am referring to. As far as the Seemae [Seemai /Seeme] is concerned, Kinnakore is very much classified under KUNDHE Seeme, it being a OORU. Other Oorus (communes) under Kundhe Seeme are Edakkadu, Mel Kundhe, Kil Kundhe, Mullimale. Whether people belonging to Hubbathalai, Kinnakorai and Koderi marry among themselves, I am not, at this point of time [28 Feb 08] in a position to confirm. About how the hattis have been grouped under an OORU [commune] and Seeme – whether based on location or relation, well it is another very interesting and unique aspect of Badaga history. As I have mentioned elsewhere, both Bearhatti and Hubbathalai belong to Porangadu Seeme. Bearhatti comes under AARU OORU- 6 villages, Jakkadha [Jagadhala] being the head hatti having a AKKA BAKKA. Hubbathalai is part of HATHOMBATTU OORU – 19 villages. People belonging to a particular OORU do not marry among themselves. For eg, a Bearhatti boy cannot marry a Jakkadha girl (being Anna Thammaru) but can marry a girl from Hubbathalai [like in my case]. I have also mentioned else where in this website, about some extrodinary exceptions like in the case of KODUMUDI Village. Since, MELE THARA [top streets] people belong to a differnt clan, they can marry from KIYA THARA [lower streets]. I know, I have not answered clearly about the classification – location or SEEME? Thanks for detailed information you provided. Just cancel this morai system as soon as possible because all our people suffering a lot. So Hope our elders help us.. Make youngsters feel free and to stay happy. Dont kill them by creating such rules. Thanks for all your information, sir. All our people are suffering from this morai system. Can our elders understand the feelings of our youngsters and try to ban this rules? Bein in own hatty and surrounding hatties only our people fall in love just because they all roaming around same region. So just break the useless rules. Make our people to be free for choosing their partner. Just let them be happy. Intercaste marriage is acceptable nowadays then why following such rules still. Feel free and try to destroy this rules. Else our people and their life will be destroying every single day. Nowadays all are having many problems in our Badaga relationship …. I am from Mulligoor (Kundhae seemae).. Can I marry from Bakkorae village in Kundhae seemae? I am Sabitha from Kinnakorai and married to T.Oranalli that comes under Maekunaadu seemay. But Thangaadu is also under Maekunaadu seemay why there is no moray to marry from Kinnakorai which some say comes under Kundha seemay. I’m interested on a guy who has no relationship to get married by the family side. But I have relationship when I look through Hatti. His village is Nanjanadu and I’m from Ketti Soraigundu. Is there any possibilities for me to marry him? Pls Reply soon. Is it possible to marry a girl from osa hatti (village near yedakadu) …? I am from kothumudi. .. .? Now a days many Badaga people have got morae relationship problem. so our elders(aiyanavakka), please find a the solution for this! If there is a relation between the hattis and not between the families, is it possible to marry?……..
Pls tell more about Bearhatti……. You have done a great job.I am married in T.OORANALLY.I know that I belong to KUNDHE SEEMAE. I am from Kinnakorai… I m sure that people of Kinnakorai migrated from Kotagiri.. So they belong to Porangadu seemay…. But you have indicated kinnakorai in kundhe seemay…. After going through the web site 2-3 hours, I came to know lots & lots of news about our community. I must say, after reading all this matters, we should proud to be an BADAGA. I also proud myself that I am the first person in my hatty serving in Foreign country as a part of peace keeping force in SUDAN (African country). Thanks for Wg Cdr JP sir, for his wishes to me. We are proud that we belong to this BADAGA community..
Plz let me know as 2 which seemai do i belong 2 …..i am from Denad near Bengal mattam………….do i belong 2 aaratty or mekkunadu seemai…….n which hatties shouldn’t i marry from. Iam very proud to be an badaga by reading all this . I’m from Kinnakorai ( nattru ). I’m sure that Kinnakorai is not part of Kundhe seeme , sorry for the vague statement. I don’t know more than that. JP adds: Why do you say that? Pl see the list of hattis as well as my comments about Kinnakorai in response to Dr.Sudhakar. Incidentally , it being the last of the Hattis along with Hiriya-seege, on the border to Kerala, has always fascinated me. We have some land in ‘OKKA NADU’ – half way on the Manjoor – Kedde road, from where we could see Kinnakore on the other side of the mountain. A breathtaking view. Do you know some of the holas[fields] of that Hatti falls in Kerala jurisdiction. I must visit that hatti soon.